A SHOUT OUT to everyone who showed up to make our 9th Annual FRESH! Food Forum a great day! A special thanks to our Sponsors - 1st Interstate Bank, 2J's Fresh Market, the Printing Center USA. Thanks, Morning Light, for the coffee to keep us going. Thank you to our 6 teachers for the excellent adult classes, and our vendors who came to make the day interesting and educational for the adults. 120 kids made the rounds to learn about growing, making wool, good nutrition, bugs and much more - pure wonderful chaos at the Kids FUN Forum. Ginger, the big pig, was a hit with everyone. We'll see you all in the Westside Orchard Garden this summer! Our Summer School in the Garden program guides nearly 200 kids from the Boys & Girls Club, the Salvation Army, the Cameron Family Center/Rescue Mission and the Center for Mental Health in growing their own garden, preparing and eating healthy snacks, learning about composting, pollinators, nutrition and more. All of the local produce is donated back to their organizations to use in their kitchens to feed club participants and their families. You're welcome at the Westside Orchard Garden anytime.....and if you want to grab a shovel (for snow?) or pull some weeds, you can walk away with a smile on your face, and a small jar of our own honey as a THANK YOU! 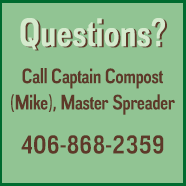 Call Captain Compost (Mike) to schedule a time as our hours change as fall and winter keep us busy out of the garden more than in. Sunburst Unlimited, Inc., dba Gardens from Garbage, grew out of a recognized need for sustainability - for the vitality of our environment and our communities. Our current food system relies heavily on transporting food grown in distant environments, which results in fuel consumption and reliance on an unsustainable system. Instead, we teach others how to grow food by nourishing what we have in our community and connecting with others who are doing the same. Continue reading about us and thanks for your interest. Come join us in the garden! The Westside Orchard Garden is a 2.2 acre plot and is the place we grow, model and employ a variety of gardening methods, teach classes for adults, mentor kids raising their own vegetables, experiment with new and innovative methods for growing, and host seminars for groups. We produce our own garden soil with bokashi composting and develop lasagna-composted gardening beds. The Boys & Girls Club youth and youth from the Salvation Army and the Rescue Mission are in the Garden 4-5 days a week in summer, along with regular visits from several Homeschool families, - 75-100 kids working, gardening, harvesting, and eating their own produce - and loving all the fresh veggies! " Cherry tomatoes are my new favorite food!" - imagine that from a 2nd grader! They love eating what they grow and our Summer in the Garden Program teaches them where their food comes from and how delicious fresh food is! We have 5 beehives, 2 from New Zealand called Flow Hives and harvest honey in the fall. Our honey is natural, raw, direct from the hive to the table (or mouth!). We distribute our honey for a donation, so if you are interested in high quality, nutritious honey, let us know.The donations help us support our programs. Our Garden Manager is in the garden all morning through early afternoon Monday through Friday, doing all the chores and tending to the crops. You are always welcome to come help out - mowing, pulling weeds, slogging manure, moving wood chips, whatever the days' chores are. It takes many hands to keep this large garden growing and beautiful. One way we're able to do all this is through community support. We're raising funds to expand the growing area and the growing time in the Westside Orchard Garden - providing even more food for the food insecure in our community, and more opportunities for kids to come and learn about fresh, healthy food! A great way to contribute is by becoming a Supporting Member. Join us when you can - take a moment out of your busy day, come outside, just sit and enjoy the ambiance of the garden or join in and help keep it weed-free. We DO live in Montana, so keep in mind that the invitation to volunteer and participate in our wonderful Westside Orchard Garden is WEATHER PERMITTING! What we do with all that food! Most of the harvest from the Garden is delivered to the Head Start, Boys & Girls Club, and Meals on Wheels kitchens, supplying fresh produce to the more than 850 meals prepared daily for food insecure kids, families, and elders. 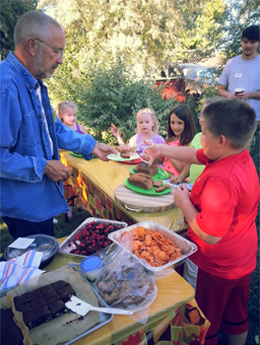 Last summer we contributed about 4,000 pounds of food. Our goal is to be able to supply fresh produce year-round for these kitchens, as well as work with others in the community who are dedicated to food sustainability for their neighbors. Spread the word and come play in the dirt with us.